You are here: Home / Hoppy Thoughts Blog / Exploring America One Beer at a Time: Road Trippin’ with 50 West Brewing Co.
“Well check that out.” Quinten, my Uber driver said as we turned off of Route 50. Pulling up to 50 West Brewing Company Quinten had his eye on an old Volkswagen bus. Two toned, bright orange and white with the 50 West logo embossed on the side the bus was a welcome and quirky sight parked right outside the door. Inside I walked past high tables and wooden stools. Old stone walls and low ceilings with stout wooden beams gave the whole scene a roadside tavern vibe. The lighting was low and warm and inviting. Stretching the length of the room a hand forged copper plated bar gave off a soft glow of reflected light. “Let me know when you’re ready.” Ben, the bartender said as he placed a beer menu down in front of me. As I glanced through the options I noticed that each beer name kept with a common theme: The great American road trip. 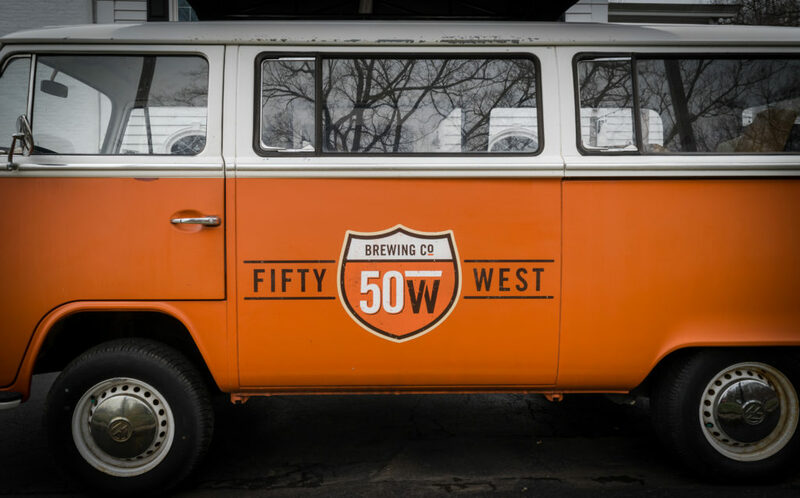 50 West’s lineup of beer embodied the spirit of cruising west into the American frontier, presumably in a classic VW bus. The names reflected stops along Rt. 50, the highway right outside the brewery’s window. A sucker for geography and my own romantic desire to tour the US by car saw me immediately pulling out my phone and pinpointing each beer designated stop along a map. 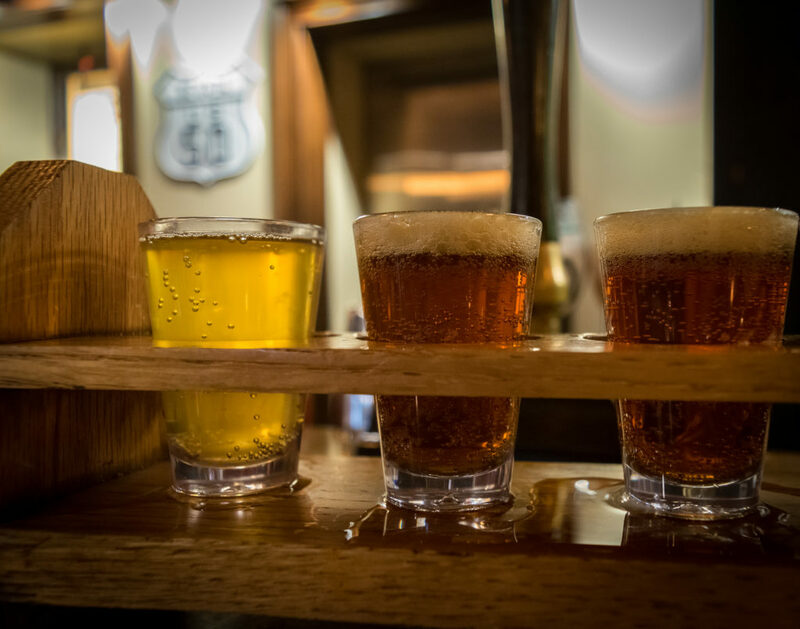 I couldn’t help but order a flight of beer that took me on this figurative road trip. Trees of Tahoe Pale Ale, its citrusy aroma and fruity notes lend sweetness to subtle undertones of pine. The result is a highly drinkable well-rounded pale that made me wish I was lakeside in eastern California. Cranking up the IBUs the Coast to Coast IPA is 50 West’s take on combining the styles of east and west. The pale combines all the fruity sweetness from the east coast with the hoppy bite of the west coast to make a surprisingly well balanced IPA. 50 West Lager, while very light bodied is packed with flavor. Malts combine well with Saaz hops to create a crisp and refreshing summer beer. A Colorado resident I couldn’t resist picking up a glass of the Gunnison Black IPA. The beer gets its namesake and color from the lesser known but awe inspiring Black Canyon of the Gunnison in central Colorado. Deep roasted flavor and bittersweet chocolate combined with a hoppy bitterness made for a welcome take on dark beer. I immediately wished I had a can to sip on for my next adventure camping along the Gunnison River. This thirst for exploration and adventure is exactly what the 50 West Brewing Co. brand hopes to conjure up with its brews. 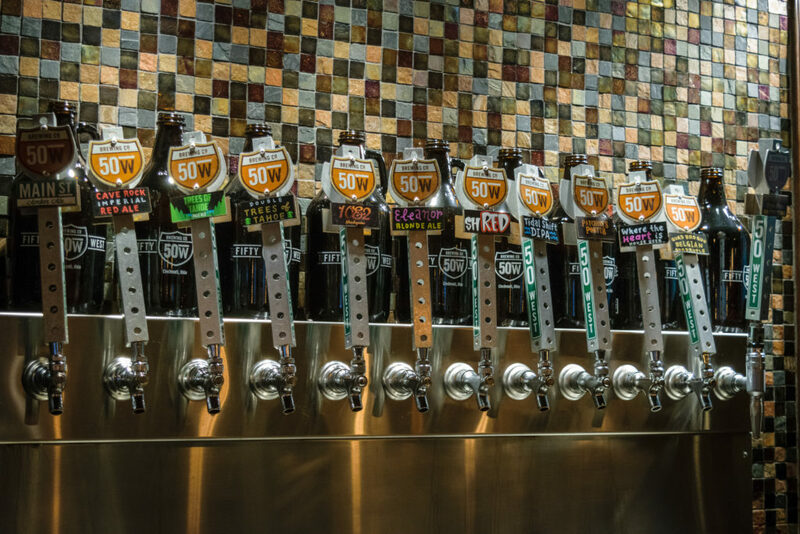 Not just a great place to drink and hangout, 50 West Brewing Company encourages the community to get out and explore. Through a number of outdoor ventures 50 West sponsors outings in cycling, volleyball, outdoor running, and canoeing. The whole concept made me long to be a local as I could see myself joining the 50 West crew on regular weekends. The Chocolate Churro Coffee Nitro Stout is a fan favorite and Ben let me know I was lucky for snagging a pint as they frequently run out. Vietnamese cinnamon sticks, Madagascar bourbon vanilla beans, and Ecuadorian and Ghanian cacao come together to make a downright delicious desert beer. Just like the popular Southwest cinnamon sugary snack, it packs all that flavor and then some into a highly drinkable stout. Afterwards, sitting back I listened to the Red Hot Chili Peppers, Under the Bridge overhead and daydreamed about cruising America’s heartland in my own VW bus. 50 West Brewing Company’s brand and philosophy had me hooked. Cranking out great tasting and creative beer while encouraging and fostering exploration made for a brewery I could stand firmly behind. The whole package shouted that beer was an adventure, business is an adventure, life is an adventure. With a pint of Coast to Coast IPA in my hands and remembering my Uber ride from earlier I made a silent toast to Quinten and the wanderlust inside us all.